Note: A reader has left a comment with important information about Hezekiah Chadwick and Hannah Voax, so be sure to scroll down to the comments. 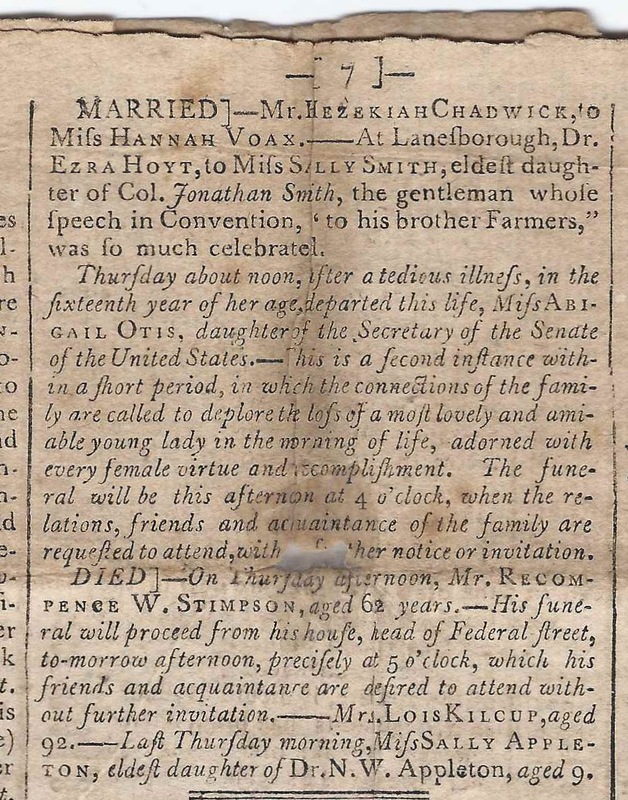 At Lanesborough, Dr. Ezra Hoyt to Miss Sally Smith, eldest daughter of Colonel Jonathan Smith, the gentleman whose speech in Convention, "to his brother Farmers", was so much celebrated. Thursday about noon. 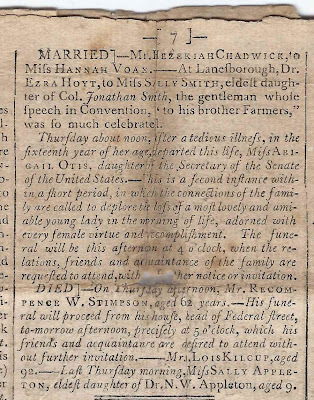 After a tedious illness, in the fifteenth year of her age, departed this life, Miss Abigail Otis, daughter of the Secretary of the Senate of the United States. - This is a second instance within a short period, in which the connections of the family are called to deplore the loss of a most lovely and amiable young lady in the morning of life, adorned with every female virtue and accomplishment. The funeral will be this afternoon at 4 o'clock, when relations, friends and acquaintance of the family are requested to attend, with no further notice or invitation. Died - on Thursday afternoon, Mr. Recompense W. Stimpson, age 62 years. - His funeral will proceed from his house, head of Federal street, to-morrow afternoon, precisely at 5 o'clock, which his friends and acquaintance are desired to attend without further invitation. I was going to do Recompense Stimpson, but he was too easy, so I picked Hezekiah Chadwick. familysearch). Hannah died Jan 1794 (MA Town & Vital Records, ancestry.com). didn't find a death record for her. Hezekiah is on the 1820 and 1830 Censuses of Methuen. There was an earlier case that was of type: spendthrift. Interesting. for him at ancestry, familysearch, or rootsweb. all others born in Mass. Well, maybe you can do Recompense when you're rushed for time, hehee. Thanks so much for adding this information - I amended the post with a note at the top for readers to check the comments section. Thanks once again, Ed! I have found where Hezekiah Chadwick is buried, if that helps. He died Jan. 27, 1834.